A poet, and author of the piyyuṭ "Et Sha'are Raẓon." He was the first Jew known by the name of Abbas; died at Mosulin 1163. His Arabic name was Abu al-Baga ibn Abbas al-Maghribi. Al-Ḥarizi (Taḥkemoni, Mak. iii.) states that Judah left the Maghreb and went to the East, where he lived now in Bagdad, and now in Aleppo, and that he had a son who was refractory. 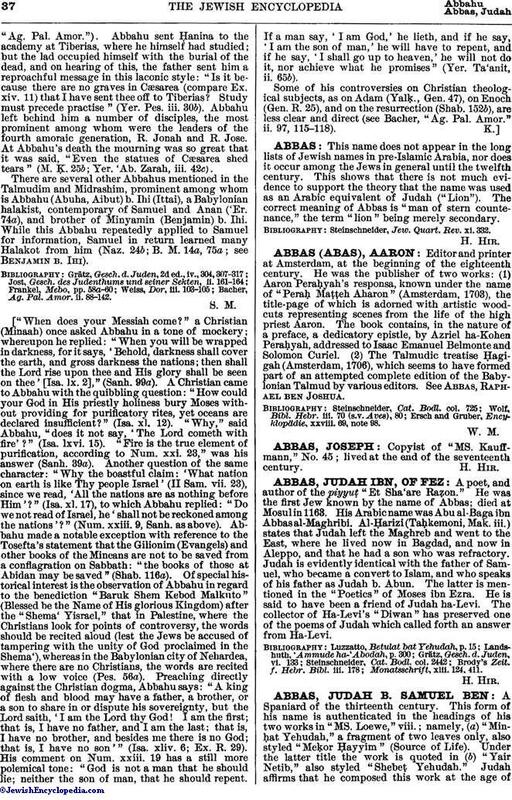 Judah is evidently identical with the father of Samuel, who became a convert to Islam, and who speaks of his father as Judah b. Abun. The latter is mentioned in the "Poetics" of Moses ibn Ezra. He is said to have been a friend of Judah ha-Levi. The collector of Ha-Levi's "Diwan" has preserved one of the poems of Judah which called forth an answer from Ha-Levi.